We recently connected with eight of the original 21 Founders of The Apache Software Foundation to take a look back at 20 years of the ASF. Joining us are Sameer Parekh Brenn, Mark Cox, Lars Eilebrecht, Jim Jagielski, Aram Mirzadeh, Bill Stoddard, Randy Terbush, and Dirk-Willem van Gulik, who were generous enough to take a walk down memory lane with us. Q: When did you first get involved with the Apache HTTP Server? What was your role? Mark: during my PhD work in 1993 I was creating new features and bug fixes for the NCSA Web server; I'd also found and fixed a number of security issues and was invited by Brian Behlendorf to join the core development team of Apache in April 1995, a few weeks after it was formed. Randy: I first got involved through finding a few like minded people that were working with the NCSA Web server. I began exchanging patches and ideas for how to make the NCSA server scale to some of the hosting challenges that we were all facing as commercial use of the Web began to grow. Late 1994 if I remember correctly. Dirk: I got involved in the early NCSA Web server days –I was working for a research lab; and we needed specific functionality to allow us to make small geographic subset on huge satellite images available as an 'image'. Something novel at that time –as the normal way to get such images was to fill out a form; fax it and then wait a few months for a large box or container with tapes to arrive. It would then take weeks or months to load up those tapes and extract just the area you needed. Jim: in 1995, initially in providing portability patches to Apple's old UNIX operating system, A/UX and then in adding features, fixing bugs and working on the configuration and build system. Lars: around 1995 during my studies I developed an interest in Unix and Internet technologies, and in Web servers in particular. I actually set up the first official Web site for the University of Siegen in Germany. Well, we didn't use Apache in the very beginning, but very quickly realized that the Apache HTTP Server is the way forward. I started helping other Apache users in various online forums, and about a year later I was asked by a German publishing company to write about the Apache HTTP Servers which was published in 1998. Sameer: I became involved when I perceived a need in the marketplace for an Open Source HTTP server that supported SSL. Ben Laurie had developed Apache-SSL but it was not possible to use it within the United States due to patent restrictions. My company developed a solution. Bill: it was 1997, and I had just become Chief Programmer for IBM's proprietary Lotus Domino Go Webserver. LDGW needed a lot of enhancements but the code base was fragile and HTTP servers, by this time, were no longer a source of revenue. Exploring alternatives to continuing development on LDGW, we found that the Apache HTTP Server had almost everything we needed in a rock solid implementation. I can't overstate how big a deal it was in IBM at the time to consider using Open Source software. Aram: late 1990s ...I migrated Apache HTTPD v1 to Linux and SCO Unix. I also had the first easy to follow Website dedicated to guiding users on setting up IP-virtual hosts/websites. Q: How did you get involved with the original Apache Group? Dirk: satellite images were both bulky, required complex user interaction to select an area on the map, and someone sensitive from a security perspective; so we needed all sorts of functionality that was not yet common in the NCSA Server, or the more science oriented data server of CERN. Randy: I got involved through what was standard operating procedure for me: hunting Usenet for other people that were trying to solve the same challenges I was. Aram: I had been sending commits to NCSA and getting rejected when I heard about a bunch of guys leaving to go start a new Web server. I went along a bit after they had started to see if I can get some recognition for Linux and SCO which had been my responsibility at the company I was working for. Sameer: I got involved when I began work on our SSL solution. Lars: in 1997 I published the first German book about the Apache HTTP Server. When documenting and testing the various features of Apache I ran into some issues and bugs and ended up submitting a fairly large number of bug reports and some patches to the Apache Group. I guess after a while they got tired of all my bug reports and invited me to become a member of the Apache Group... and therefore allowing me to apply the bug fixes myself. Bill: the Apache Group's home page indicated that they would welcome company participation in the project. That opened the door for James Barry, an IBM Product Manager, and Yin Ping Shan, an IBM STSM, to contact Brian Behlendorf about IBM's participation in the project. I had the opportunity to meet Brian at IBM in RTP soon after and I was assigned to be the sole IBM developer to participate in the Open Source community. Did I mention how terrified IBM was of Open Source? My ability to work on future proprietary IBM products –and stay employed with IBM– was deemed 'at risk' because of 'contamination'. Q: When did you first meet other members of the Apache Group in person? How did it feel? Sameer: I've known Brian since we were both undergrads at UC Berkeley, so I met him before my involvement in the Group. Randy: I first met other members face-to-face when we all gathered at Brian Behlendorf's apartment in San Francisco. Someone else will need to help me with what year that was. Bill: ApacheCon 1998 in San Francisco. Jim: The first time I met other members was at the first ApacheCon. I was, and still am, located on the East Coast of the US and most of the other members, who were not based in Europe, were on the West Coast, or close to it. What was cool was how despite not meeting each other face-to-face until then, how much it felt like we were old friends. Mark: IBM had sponsored a get-together of the team in 1998 in California. We'd only ever communicated by email and so meeting in person really helped us to understand each others motivations and interests as well as set the stage for the legal entity. Lars: the first time I met the members of the Apache Group was at the very first ApacheCon held in San Francisco in 1998. I had just finished my master degree and it was my first trip to the USA. Don't forget to show them the first picture that shows all Apache core developers at ApacheCon 1998! Dirk: extremely natural; as if you knew these people for years, which we did at that point. Just a few minutes to adjust to how people looked; and another hour or so to adjust to their particular flavor, accent or dialect of English; something which is not easily apparent for a non-native speaker from their emails. And strangely –from that moment on– reading their emails would ring that accent, that regional voice; while the actual physical appearance would fade quickly. Aram: I believe it was a while before I attended an Apache Conference. It was in Florida, before Y2K. It was pretty weird sense of being anonymous (since I didn't have any other online profile) and being known. I sort of hid my name tag inside of my shirt walking around and at the table conference I sort of stood to the side and let the other guys take questions. I'm not sure most of the other developers knew who I was for most of the conference. Q: What made the Apache Group decide to incorporate the ASF? How quickly was this decision made? Jim: as the Internet and the Web started really getting entrenched, we knew that we needed something more legal to protect ourselves. Also, at the time, IBM wanted to use Apache httpd as the basis of their Web server, and they were uncomfortable with the idea of using software from some nebulous, semi-official gathering of people informally called "The Apache Group". So it was a perfect storm situation where we were ready to incorporate and had an ally who could, and did, help us. The decision was reached very quickly. Dirk: we relied on the NCSA Server; we were just a bunch of patches on top of their software. So when key staffers left to form what ultimately would become Netscape –we had to consider the options. At the same time; the market was heating up. Apache was becoming quite dominant. Microsoft had entered the fray. The crypto needed for SSL security attracted regulatory attention. Some browser vendors had a hard time keeping up. And I strongly suspected that things like patents where being filed 'on our code'. Simultaneously –IBM, whose Domino WebServer was rapidly losing market share...and they were looking at Apache–to switch to 'Open Source'. But with NCSA dropping out –there was no clear legal owner of it all. And the impact of the USL vs. AT&T trials over BSD had just started to sink in. So these things; all combined ...and of course the, for me as a European, rather aggressive litigation habits of Americans... conspired and made for a quick decision. Randy: we were operational as the Apache HTTPD Server Project for a few years before deciding to incorporate. This was motivated by a number of things. As I remember, some of those motivations were to put in place some legal protections for contributors and the companies that some of us worked for. Other reasons were to help us form an organization that could being receiving both cash and other donations to help fund the vision that we were developing. The ultimate goal was to build an organization that would support growing the mission of Open Source development participation and adoption. Bill: the decision to incorporate was triggered by IBM's interest in participating in the project. Apache Group was very open minded in listening to IBM's concerns and together, Apache Group, and IBM hammered out an engagement model that we believed would be reasonably lightweight while protecting the core interests of Apache Group and participants. I think IBM's interest in the project also provided another data point validating the viability of Open Source. Q: What Apache projects were you contributing to? Aram: HTTPD, HTTPD/2, Commons, a couple of minor ones here and there. Dirk: mostly the Web server back in those days. And helping various XML and Java projects, such as Tomcat, getting out of the gate. Randy: my primary involvement was the Apache HTTPD Project along with my participation as a Board member. Mark: my involvement in the Apache HTTP Server continued for some years and I handled security issues, occasional release manager, and wrote modules like mod_status. Outside of the ASF, together with Paul Sutton, another core developer, we launched Apache Week. Apache Week was a weekly look at the state of Apache development and ran from February 1996 through to 2004. My work life revolved around Apache too, founding C2Net in Europe which created Stronghold, a commercially supported version of Apache with security. Sameer: just the HTTP Server. Bill: Apache HTTP Server, Apache Portable Runtime. Lars: apart from the Apache HTTP Server project I joined the Conference Planning project when it started. Attending ApacheCon in 1998 left a big impression on me. Meeting the other developers was amazing, but also having a chance to talk to some of the users. It made me realize that we needed to provide regular opportunities for users and developers to meet. A lot can be done via Web sites, Wikis, and mailing lists, but nothing beats meeting face to face. I helped plan ApacheCon events from 2000 until 2009 and served as VP for the Conference Planning project for the last two years. Q: What is your current involvement with the ASF? What are you up to today? Jim: I am still quite involved with the ASF and was fortunate enough to have served on the board since Day 1 until last year when I took a break. I accepted the nomination to run again this year so by the time this is published, who knows, I might be a Director again. But as I said, I still am very active on the Foundation and the Project efforts. Dirk: little; some ASF-wide stuff in general and security responses/coordination in particular. Randy: unfortunately, my schedule does not allow me to be involved with the ASF these days. Aram: I'm emeritus. About 16 years ago I joined a company that does not allow contribution to Open Source and have been sidelined since then. I'm still an avid reader of the mailing lists and try to keep up with the Board updates. The good news is that in the last few months I have changed enough minds that there is a new legal document going into effect that removes the no-contribution rule. Mark: one of the main things Apache Week did was track security issues in the HTTP Server project, providing a database of vulnerabilities as well as commentary and severity levels. I rolled this up back to the project and this led to me taking a more focused role on helping with security issues across Apache projects. As Vice President for ASF Security I still work every week on helping projects handle the security issues reported to them. I maintain the CVE Numbering Authority for Apache and am on the CVE board. Sameer: I don't do very much with the ASF other than use many ASF Open Source projects. These days I am primarily focused on being a Dad to my 3 kids. Bill: I watch from afar as an emeritus member of the ASF. I follow the Members mailing list. Lars: I'm not as active any more than I used to be in the ASF. That's especially true since my son was born in 2017... as far as possible I still try to stay up-to-date with the Apache HTTP Server project, Community Development, and with the Apache Security Team. In my day job I am self employed working as an IT consultant, typically with a focus on IT Security Architecture. After living for 10 years in London I'm currently in the process of moving to Berlin. Q: Could you share how the ASF and The Apache Way has impacted your work? How has it (the impact) changed over time? Dirk: like any industry/peer/professional society –it is a great place to learn, to refine, to socialize– that improves day to day professional work. Jim: we were lucky with the Apache Way... a lot of the decisions that made sense and were "expedient" when we made them have stood the test of time. I think this is because we wanted to create a place where people were welcomed and rewarded for volunteering their talents and skills and all contributions were appreciated. Randy: my involvement with the ASF helped me to solidify my belief that we are better at solving problems in collaborative processes. When I first discovered Open Source back in the late 1980s, it made so much sense that better solutions happened when groups of people were able to discuss and expose their work to peer review by some of the brightest minds in the computer industry. I've had a great luxury to work with some of those people through collaboration in the ASF and other peer reviewed groups. This has made me better at what I do, and has helped me learn how to listen to others in these environments. Mark: the expertise and knowledge I gained through working on the Apache HTTP Server led directly to my first job offer; and through various acquisitions I'm still in the same company. So I've Apache to thank for several decades of interesting, challenging, and rewarding work. While I've not got involved in coding for Apache projects for quite some time, my expertise and insights are still useful and I am able to keep my hand in writing the occasional script. Bill: the members of the original Apache Group and the Apache HTTP Server projects quite literally changed my life and world view. I walked in, as a developer 'assigned' by IBM. Although I had to earn commit access through my contributions, the nature of my assignment was antithetical to Apache Group norms. The group accepted me, with some reluctance by some of the members. I cannot thank the members of the group enough for showing me the ropes. I listened, and learned and I am a better person for it. I am grateful for the good fortune of being in the right place at the right time to be at the center of the birth of the Open Source movement. I would like to thank all the members of the original Apache Group and my colleagues at IBM for making it possible. Q: What influence do you think the ASF and The Apache Way has had in the industry? Dirk: collectively we have, as an industry and as the ASF, found ways to collaborate –even though we intensively compete in other areas. And that collaboration was crucial for the open Internet; where interoperability was key. It kept the core of the World Wide Web relatively open; preventing large walled-gardens from appearing early. Randy: I believe that the biggest influence that the ASF has had on the industry is to facilitate participation in the process of Open Source development. While the ASF was not the first ever organization to do Open Source development, I believe that it was one of the first that actively solicited involvement from other corporations to get involved in the process. We had great experiences with a number of businesses that saw the advantages of being part of the solution and dedicated their development resources toward working with the ASF to improve the software that was being developed while bringing forward their customer's requirements. I spent a lot of time in the early days explaining these companies what Open Source was and why anyone would want to dedicate their free time to participating in software development without making money. I'm happy to see that most leading technology companies understand those advantages today and many of them are active participants in the process. Aram: the Apache License is well known and followed by many non-ASF projects. Many of the ASF projects are leaders in their respective fields/technologies. Mark: the creation of the Apache License has spawned a whole generation of Open Source software that follows the ideals of Apache even when that software isn't necessarily created by The Apache Software Foundation. A meeting of a number of core Apache developers at an early ApacheCon led to the formation of OpenSSL; which, although not an ASF project, has followed the ideals of Apache and has now even adopted the Apache License for future versions. Lars: The Apache Way is certainly the ASF's biggest "export". It has inspired many companies to implement similar principles for their internal development projects. Many of the projects at the ASF are cornerstones of the IT industry and the Internet. Open Source software and Apache software in general has enabled many startup companies to compete with the big players and be successful. Proprietary software is on the demise and Open Source software plays a central part of the long-term IT strategy of many companies. The ASF and especially the Apache License has played a big role in this. Bill: the ASF, and our licensing model, made Open Source acceptable to a much larger audience. The Apache Way provided an equitable way for anyone with the time and right set of skills to influence the direction of ASF projects. Jim: the ASF has served as the cradle and the crucible for just about every innovative technological advancement that has happened over the last decades. The Web, Java, Email, Wikis/blogs, databases, Big Data, PubSub, Machine Learning, AI... all of these technologies have their roots in the projects and communities within Apache. In many ways we have defined the industry and created several. The Apache Way is currently being recognized as the premier software development paradigm, and serves as the foundation for InnerSource, which is transforming Enterprise IT development. Q: What advice do you have for those starting in Open Source? Why is Apache a good community to become involved with? Jim: Open Source is about honing your skills and your talents, about working with like-minded people who value you and your talents and your contributions; a place where you gain merit based on what you do. Find a project you are passionate about and share that passion with those who feel the same; that's easy at Apache. Randy: for anyone wanting to participating in Open Source development, I believe that the ASF provides a great structure and community for helping newcomers navigate the challenges of getting started. You'll find a welcoming group of your peers there that will gladly guide you toward things that need to get done or hear you out about the things you believe you could start doing to participate. Aram: I just responded to something similar on Reddit. My advice would be to pick one or two projects where you are a user, a subscriber. Contribute to that project so that you can see the results right then and there. I have seen people try to bolster their resumes with Open Source project contributions but then when you ask about the project itself they don't know much about them. It's important not only to contribute code but to also contribute to the culture of the project and its direction. Mark: I've yet to find an Open Source project that doesn't have something that someone new can help with; you don't have to be an expert with all the code to contribute to a project –I've not written any code for Apache projects in over a decade yet there are still many ways I can add value to the ASF. With so many different projects with different userbases with different programming languages there's bound to be something that matches the skills and interest levels of folks starting out for the first time. Dirk: code cannot live in isolation, or on itself, for long periods of time. Code requires a community to evolve it, to nurture it, to make sure it grows in the right directions and to dampen others that may be just too esoteric to maintain long term. So it is Community Over Code. A very fragile balance. But once; if you get this right –can really make things fly. Bill: the ASF is an extremely open and accepting community full of really great people. Pick the project that interests you, then lurk, listen, and learn. Take the time to understand how the community works, then reach out to someone in the community and see if they would be willing to coach you. Go slow, learn, respect the sensibilities of community members and processes and you will be successful. Q: What do you think is needed to strengthen the ASF as it looks forward to the next 20 years? Dirk: one of our core drivers is –or was– the need for the Internet to be open and interoperable. And that this need drove all inclusive, forums such as the ASF where people could collaborate on technology and make it work well together. Even if their employers compete –or especially if their employers compete. The world has changed since –large platform players balkanize certain areas and are able to push through 'their' technology on 'their' agenda. This negating their need to collaboratively work with others to be interoperable. Or even their need to 'contribute' back. And simultaneously –companies and investors are learning how to better control –or game– these collaborations; how to create 'pay to play' Open Source foundations; and how to allow money to drive product direction. These two things break the feedback loop that allowed Apache to mature, grow, increase quality. So we need to learn how to deal with this; find new positive feedback loops and amplifiers to offset those we've lost. Randy: I think that one of the things that any Open Source community would benefit from is active involvement in educational curricula. Through involvement in the education process in both K12 and beyond, Open Source communities gain relevance and participants. Aram: too many thoughts on this one ...I think we do need not only more communication, but better means of communication. As "techies" I think our communication is a bit too technical at times. One more P.S. here ... the "ASF" logo should be more of a brand. It's simply an umbrella project and a copyright today. Looking at the next 5, 10, 20 years the ASF brand should stand for good practices, open communication, Open Source, etc. –not that it isn't today ... it simply doesn't have the reach into the business world. Bill: interesting question. Is 'strengthen' the right way to look at the future or is 'adapt' a better word? People and company motivations for participating in Open Source communities have evolved and will continue to evolve in the future. The ASF, as a public charity, will need to adapt to changing requirements in order to survive and thrive. Lars: we must make sure that we strengthen the use of "The Apache Way" principles, and continue focusing on the community and individual contributors. We must learn from cases where a new contributor left a project, because the project wasn't welcoming or open enough and try to fix these issues. Innovation cannot happen without a healthy community. Reinforcing "Community Over Code" is a great way to close this out! Thank you, Aram, Bill, Dirk, Jim, Lars, Mark, Randy, and Sameer, for your thoughtful responses and sharing these great memories –it's so great to catch up with all of you. Thank you, and your fellow founders –Brian Behlendorf, Ken Coar, Miguel Gonzales, Ralf Engelschall, Roy Fielding, Dean Gaudet, Ben Hyde, Alexei Kosut, Martin Kraemer, Ben Laurie, Doug MacEachern, Cliff Skolnick, Marc Slemko, and Paul Sutton –for this tremendous gift to humanity. You have transformed our lives. Apache has been at the forefront of dozens of today's industry-defining technologies and tools; nearly every end-user computing device has been touched by at least one Apache product. Budapest, Hungary –19 November– At ApacheCon Europe, members of the Apache community commemorated The Apache Software Foundation (ASF)'s fifteenth anniversary and congratulated the people, projects, initiatives, and organizations that played a role in its success. Apache products power half the Internet, manage exabytes of data, execute teraflops of operations, store billions of objects in virtually every industry, and enhance the lives of countless users and developers worldwide. Apache projects power mission-critical applications in financial services, aerospace, publishing, big data, Cloud computing, mobile, government, healthcare, research, infrastructure, development frameworks, foundational libraries, and many other categories. Beginning with the Apache HTTP Server —the world's most popular Web server— Apache software has been at the forefront of dozens of today's industry-defining technologies and tools, playing an integral role in nearly every end-user computing device, from laptops to tablets to mobile phones. Apache software is so ubiquitous that 50% of the top 10 downloaded Open Source products are Apache projects. The commercially-friendly and permissive Apache License v2 has become an industry standard within the Open Source world. The Apache License and open development model are widely recognized as among the best ways to ensure open standards gain traction and adoption. The ASF offers a vendor-neutral space in which to collaborate whilst enabling third parties to pursue almost any for-profit or not-for-profit business model. To date, hundreds of thousands of software solutions have been distributed under the Apache License. Amazingly, this is achieved by an all-volunteer community comprising 505 individual Members and 4,081 Apache Committers collaborating across six continents. The ASF's day-to-day operating expenses are offset by the generous sponsorship of individual donors and corporate sponsors including Citrix, Cloudera, Comcast, Facebook, Google, Hortonworks, HP, IBM, Matt Mullenweg, Microsoft, and Yahoo. "ASF @ 15" Timeline and Highlights follow. Visit http://apache.org/ and @TheASF on Twitter for more information. Brian Behlendorf started collecting patches to be applied to the last version of the NCSA http server. The Apache Group, consisting of 8 individuals, traded patches on a mailing list set up for the purpose. In April of 1995 the first public release of Apache (version 0.6.2) came out. Apache 1.0 released on December 1, 1995, and within a year surpassed NCSA as the most-used Web server. The ASF formally incorporates as a Delaware-based 501(c)(3) non-profit corporation from The Apache Group on 1 June. Original directors are: Brian Behlendorf (President), Ken Coar (VP Conferences), Roy T. Fielding (Chairman), Ben Hyde (VP Apache HTTP Server Project), Jim Jagielski (Secretary and EVP), Ben Laurie, Sameer Parekh, Randy Terbush (Treasurer), and Dirk-Willem van Gulik. New Apache Jakarta and XML Projects join the Apache HTTP Server Project. Board Committees on ASF Conferences, Licenses, and Security are formed. Discussions about ASF's role as an Open Source incubator address fostering new technologies such as Cocoon. The ASF receives numerous industry awards, including the ACM Software System Award, the Datamation Product of the Year, and LinuxWorld Editor's Award. ASF is listed in the Industry Standard's "100 Companies That Matter" and included in the ServerWatch Hall of Fame. Perl-Apache Project, as well as Apache PHP, Apache/TCL Project, and Apache Portable Runtime Project are established. Apache Struts, Batik, FOP, and Ant undergo "incubation". The ASF draws record attendance at the second ApacheCon in Orlando (the first-ever conference was held in San Francisco in 1998), and launches its first European event in London later that year. Apache Avalon, Commons, and Jetspeed/Portals undergo "incubation". Work begins on next version of the Apache License. The fourth ApacheCon is held in Santa Clara, where the ASF maxim of "Community Over Code" is widespread and collaborators meet in person for the very first time. The ASF receives the Internet Service Providers Association's Internet Industry Awards for "Best Software Supplier" Apache XML's Xalan-Java 1.2.2 is a finalist in the Best Java-XML Application category in the JavaWorld Editors' Choice Awards. Participation in The ASF booms; its process for community and collaborative development becomes known as "the Apache Way". New Board is formed: Greg Stein elected Chairman, Dirk-Willem van Gulik as President, Randy Terbush as Treasurer (later replaced that year by Chuck Murko), and Jim Jagielski as Executive Vice President/Secretary. Apache Jakarta launches sub-project BSF; the Apache Incubator Project is born: new projects include Apache Ant, Avalon, DB, Forrest, HC, POI, and TCL. Apache HTTP Server and Portable Runtime Project Management Committees are reestablished. New Board Committees on Infrastructure as well as Fundraising are formed. The ASF participates in the Java Community Process. The fifth ApacheCon takes place in Las Vegas. The first community-driven Apache Cocoon GetTogether is held. "Web 2.0" comes to the ASF; the Apache Web Services Project is formed. New projects in the Apache Incubator include Directory, Geronimo, Gump, James, Logging Services, Maven, Pluto, SpamAssassin, Tapestry, and XML Beans. Perl-Apache Project is renamed to the Apache Perl Project, and Cocoon becomes a Top Level Project. The sixth ApacheCon is held in Las Vegas, featuring an expo exchange with COMDEX. The Apache HTTP Server wins Best Server Software by Linux Format; Apache Ant wins Software Development Magazine Jolt Product Excellence and Productivity Award, the Java Pro Readers' Choice Award for Most Valuable Java Deployment Technology, as well as the JavaWorld Editors' Choice Award for "Most Useful Java Community-Developed Technology". JavaWorld also awards Apache Xerces-J Editors' Choice for "Best Java XML Tool". SpamAssassin wins the OSDir Editor's Choice Award. The Apache License v.1.2 is released; all products of the Foundation are required to be released under the new license. ASF Board members are re-elected: Greg Stein as Chairman, Dirk-Willem van Gulik as President, Chuck Murko as Treasurer, and Jim Jagielski as Executive Vice President/Secretary. The stable Apache License v.2.0 is released, and the ASF Contributor License Agreement (CLA) is expanded to accommodate corporate donations. New Apache projects in the Incubator include Beehive, Excalibur, Forrest, Gump, Hivemind, iBatis, Lenya, myFaces, Portals, SpamAssassin, Struts, wsrp4J (Portals sub-project), Xalan, XMLBeans, and XML Graphics. The Apache Commons project is terminated, as well as the Project Management Committee for Avalon. A New Public Relations Committee is established, and The ASF issues a formal response regarding alleged JBoss IP infringement in Geronimo. The PHP project amicably separates from The ASF, granting all rights and responsibilities pertaining to its codebases to the PHP Group. ApacheCon returns to Las Vegas for its seventh conference. Apache Ant wins the Java Developer's Journal "Editors' Choice Award". The ASF continues to be the community of choice to spearhead new innovations through its Incubator. Numerous projects in development include activeMQ, Apollo, Bridges, Continuum, Derby, Directory, Felix, Harmony, Roller, stdcxx, Synapse, and Xerces; Apache Lucene graduates as a Top Level Project. ApacheCon returns to Europe with the eighth conference held in Stuttgart, Germany, followed by ApacheCon US in San Diego. Tomcat receives the SD Software Development Readers' Choice Awards for "Best Open Source Tool"; Software Development Magazine's JOLT! Awards recognize Apache Jakarta and Tomcat. A new Board of Directors is elected: Greg Stein and Jim Jagielski are re-elected as Chairman and Executive Vice President/Secretary respectively; Sander Striker joins the Board as President, and Justin Erenkrantz is elected Treasurer. The Incubator matures, with new projects created to meet growing industry interest in Open Source solutions for enterprise resource planning and manage related business processes. Projects undergoing incubation are Abdera, Archiva, Cayenne, CXF, Hadoop, Harmony, HiveMind, Jackrabbit, MINA, ODE, OfBIZ, Open JPA, Open EJB, Qpid, Santuario, Shale, Tapestry, Tiles, and Velocity; Apache Cayenne, OFBiz, and Tiles graduate to become Top Level Projects later that year. The Apache Security Team is re-established, a new Testing project is established to oversee the creation of software related to the domain of software testing; in addition, and the ASF launches new Innovation Laboratories for the experimentation of new ideas without Project bylaws or community building requirements. The ASF hosts its tenth ApacheCon in Dublin, Ireland, followed by ApacheCon US in Austin, and launches ApacheCon Asia in Colombo, Sri Lanka. The Foundation establishes the Sponsorship program to help offset day-to-day operating expenses; donations are accepted by both individual and corporate contributors. SpamAssassin wins the Linux New Media Award, and Tapestry was awarded Sun's annual Duke's Choice Award for outstanding Java product innovation. The breadth and capability of The ASF is reflected in the largest changeover its Board members since its incorporation: Jim Jagielski is elected Chairman, Justin Erenkrantz as President, J. Aaron Farr as Treasurer, and Sam Ruby as Executive Vice President/Secretary. New projects continue to germinate, including Buildr, Camel, C++ Standard Library, Pig, Quetzalcoatl, ServiceMix, Synapse, and Tiles entering the Incubator; Apache ActiveMQ, Commons (Jakarta), Felix, HttpComponents, ODE, OpenEJB, OpenJPA, POI, Quetzalcoatl, Roller, ServiceMix, Turbine, and Wicket graduate as Top Level Projects. The ASF establishes a Legal Affairs Committee to manage legal policies, as well as a Travel Assistance Committee to provide financial support to select individuals otherwise unable to attend ApacheCon. The twelfth ApacheCon is successfully held in Amsterdam, The Netherlands, followed by ApacheCon US in Atlanta. The ASF re-elects Jim Jagielski, Justin Erenkrantz, and Sam Ruby to the Board as Chairman, President, and Secretary respectively; Sander Striker is elected Executive Vice President, and J. Aaron Farr is Treasurer. HBase, Hive, and Zookeeper enter the Incubator; Apache Abdera, Archiva, Buildr, Continuum, CouchDB, CXF, Hadoop, Qpid, and Tuscany become Top Level Projects. The Apache Attic is established to retire ASF projects that have reached their end of life through a scalable process. Apache user gatherings continue to gain popularity, with events hosted by projects that include Cocoon, Derby, Forrest, Hadoop, Jakarta, OfBIZ, Pig, Wicket, among others. The fourteenth ApacheCon is held in Amsterdam, The Netherlands, followed by ApacheCon US in New Orleans, where sixty members of the community participate in voluntourism efforts to help rebuild the City still suffering from the effects of Hurricane Katrina. ApacheCon US also marks the expansion of ASF-wide developer and user community events to include "unconferences" such as BarCamps, GetTogethers, Symposia, and the first ASF Meet Up in Beijing. Apache tops the Software Development Times 100 list of Industry Influencers for the third year running in the category of Application Servers, The ASF wins its third Member of the Year prize awarded by the Java Community Process Program Management Office, Apache SpamAssassin won the InfoWorld "Best Of Open Source Software" BOSSIE Award, Apache Directory Studio finishes as runner-up for the Eclipse Community Award's Best Open Source RCP Application, and barely six months under incubation, Sling wins the JAX Innovation Award. The ASF announces Ten Years of Apache; celebrates a decade of innovation in Open Source software and community development. Nearly 300 ASF Members collaborate successfully with more than 2,000 Committers; 68 Top Level Projects, 35 initiatives in the Incubator, and 23 Labs concepts are currently active at the Foundation. ApacheCon Europe 2009 was held 23-27 March in Amsterdam, with the Hackathon (face-to-face Apache project-related collaboration/development with ASF Members and Committers) open to the public and including another BarCamp. 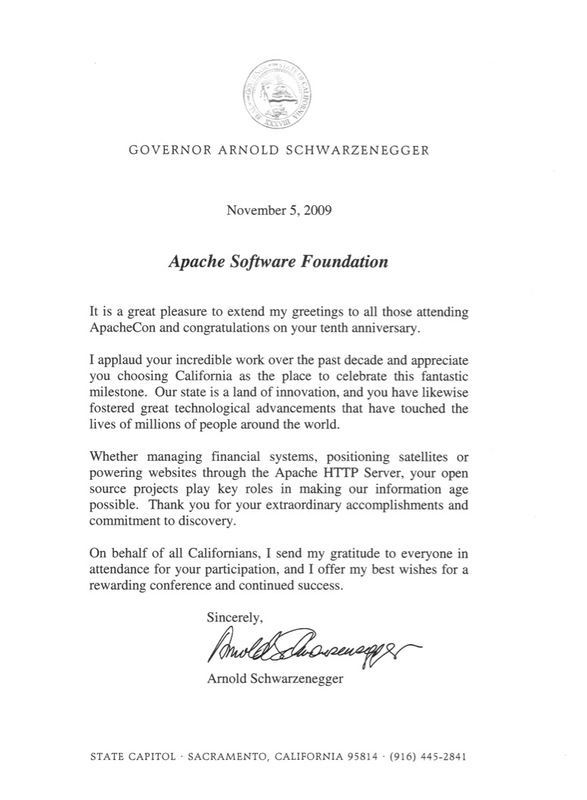 10th Anniversary celebrations continued at ApacheCon US 2009, in Oakland 2-6 November, where both the Governor of California and the Mayor of Oakland congratulated Apache on its success and named 4 November "Apache Software Foundation Day". The ASF hits its millionth code commit with a revision milestone today with a commit by ASF Member Yonik Seeley on behalf of the Apache Lucene Project. Apache Aries, Avro, Cassandra, Click, ESME, HBase, Hive, jUDDI, Karaf, Mahout, Nutch, OODT, Pig, Pivot, Shindig, Shiro, Subversion, Thrift, Tika, Traffic Server, UIMA, ZooKeeper become Top-level Projects. Alois, Amber, Bean Validation, Celix, Chukwa, Deltacloud, Gora, Isis, Jena, Kitty, Lucy, ManifoldCF, Mesos, NPanday, Nuvem, OODT, OpenNLP, SIS, Stanbol, Wave, Whirr, and Zeta Components entered the Apache Incubator. Milestone project releases include Cassandra 0.6, Cayenne 3.0, FOP 1.0, Maven 3.0, SpamAssassin 3.3.0, and Tomcat 7.0. Apache Excalibur, iBatis, Quetzalcoatl, and WSIF Projects were retired to the Attic. The ASF launches "Apache Extras" (hosted by Google) to provide a "home-away-from-home" for code associated with Apache projects. The ASF issued Public Statements about Apache Harmony as well as Oracle's decision on the Java SE Technology Compatibility Kit's Field Of Use, and resigns from the Java Community Process Executive Committee. Shane Curcuru, Doug Cutting, Bertrand Delacretaz, Roy T. Fielding, Jim Jagielski, Sam Ruby, Noirin Shirley, Greg Stein, and Henri Yandell have been elected to serve on the ASF Board of Directors; Geir Magnusson, Jr., is named as replacement for Henri Yandell. ASF Director Greg Stein awarded O'Reilly Open Source Award at OSCON. New role of Executive Assistant has been created and staffed. 30 new ASF Members were elected this year. ASF Platinum Sponsors are Google, Microsoft, and Yahoo! ; IBM joins Gold Sponsor Hewlett-Packard; Silver Sponsors are Cloudera, Progress Software and Springsource/VMWare, and Bronze Sponsors are BlueNog, Intuit, Joost, and Matt Mullenweg. ApacheCon North America took place in Atlanta, Georgia. BarCampApache in Sydney, Australia, was the first ASF-backed event to take place in the Southern Hemisphere. Apache ACE, Chemistry, Deltacloud, JMeter, Libcloud, River, Whirr became Top-level Projects. More projects than ever submitted to become part of the Apache community: Accumulo, Airavata, Ambari, Any23, AWF, Bigtop, Bloodhound, Cordova, DeltaSpike, DirectMemory, EasyAnt, Flex, Flume, Giraph, HCatalog, Kafka, Kalumet, Lucene.Net, MRUnit, ODF Toolkit, OGNL, Oozie, OpenMeetings, OpenOffice, Rave, S4, and Sqoop entered the Incubator. Apache Alois retired from the Incubator. Apache Harmony, Jakarta, and Xindice moved to the Attic. Milestone project releases include Cassandra 0.7 and 1.0, Geronimo v3.0-beta-1, Pivot 2.0, Subversion 1.7.0, Tika 1.0, and Turbine 4.0-M1. Apache TomEE is certified as Java EE 6 Web Profile Compatible. Apache UIMA and Hadoop advance data intelligence and semantic capabilities of Watson, IBM's "Smartest Machine on Earth" demonstrated in first-ever man vs. machine competition on Jeopardy! quiz show. Apache Hadoop wins MediaGuardian’s "Innovator of the Year" award. The ASF accepted to become an Affiliate at the Open Source Initiative. New Executive Committee is appointed: Doug Cutting as Chair, Greg Stein as Vice Chair, Jim Jagielski as President, Noirin Plunkett as Executive Vice President, Sam Ruby as Vice President - Infrastructure, Craig L Russell as Secretary, Sam Ruby as Assistant Secretary, and Geir Magnusson, Jr., as Treasurer. The ASF is subpoenaed by the United Stated District Court to produce documents in Oracle America vs. Google related to the use of Apache Harmony code in the Android software platform, and the unsuccessful attempt by Apache to secure an acceptable license to the Java SE Technology Compatibility Kit. The ASF issues statement on Apache OpenOffice.org (the first mature, end-user-facing Apache project) and Open Letter to the Open Document Format Ecosystem clarifying that its code base was not pursued by the ASF prior to its acceptance into the Apache Incubator, and articulating the project’s vision within the wider Open Document Format ecosystem. 42 new ASF Members were elected, bringing the active membership to 370 individuals and 2,663 Apache Commiters world-wide. ASF Platinum Sponsors are Google, Microsoft, and Yahoo! ; AMD, Facebook, and Hortonworks join Gold Sponsors Hewlett-Packard and IBM; PSW Group joins Silver Sponsors Cloudera, Progress Software and Springsource/VMWare; and Liip AG, Lucid Imagination, Talend, and WANdisco join Bronze Sponsors BlueNog, Intuit, Joost, and Matt Mullenweg. ApacheCon North America took place in Vancouver, Canada, marking the 25th event in the conference series. The ASF celebrated the 17th Anniversary of the Apache HTTP Server with the release of v2.4; the project maintains its standing as the world's most popular Web server, powering nearly 400 million sites. The Apache Incubator continues to gain momentum, with 85 podlings graduating over the past decade. Apache Accumulo, Airavata, Any23, Bigtop, BVal, Cordova, Creadur, DirectMemory, Empire-db, Flex, Flume, Giraph, Gora, Hama, ISIS, Jena, Kafka, Lucene.Net, Lucy, ManifoldCF, MRUnit, Oozie, OpenNLP, OpenOffice, Rave, SIS, Sqoop, Stanbol, Steve, Syncope, VCL, Wink, Wookie become Top-level Projects. Allura, Blur, CloudStack, Crunch, cTAKES, DeviceMap, Drill, Hadoop Development Tools, Helix, Marmotta, Ripple, Streams, and Syncope entered the Incbuator. Apache AWF, HISE, Kato, Kitty, and PhotArk retired from the Incubator. Milestone project releases include Deltacloud 1.0, Hadoop 1.0, Nutch 2.0, TomEE 1.0, Traffic Server 3.2, and Wicket 6.0. New Executive Committee is appointed: Doug Cutting as Chair, Greg Stein as Vice Chair, Jim Jagielski as President, Ross Gardler as Executive Vice President, Craig L Russell as Secretary, Chris Mattmann as Treasurer, and Sam Ruby as Assistant Secretary. ASF Officers that now serve at the direction of the President are: Vice President, Brand Management; Vice President, Fundraising; Vice President, Marketing and Publicity; and Vice President, Conference Planning. The office of Vice President, Java Community Process is dissolved. 46 new ASF Members were elected this year. Citrix became an ASF Sponsor, joining Facebook, Google, Microsoft, and Yahoo! at the Platinum level; AMD, Hortonworks, HP, IBM, and Matt Mullenweg at the Gold level; GoDaddy, Huawei, and In Motion Hosting joined Basis Technology, Cloudera, PSW GROUP, SpringSource, and WANdisco at the Silver level; and Intuit and Twitter joined BlueNog, Digital Primates, Intuit, Joost, Liip AG SA Ltd, Lucid Imagination, Talend, and Two Sigma Investments at the Bronze level. The ASF returned to Europe with the ApacheCon Europe Community Edition in Sinsheim, Germany, underwritten and hosted by SAP. Apache Ambari, Bloodhound, Chukwa, Clerezza, CloudStack, Crunch, cTAKES, Curator, DeltaSpike, Etch, Helix, jclouds, JSPWiki, Marmotta, Mesos, Oltu, Onami, OpenMeetings, graduate as Top-level Projects. Aurora, BatchEE, Curator, Falcon, jclouds, Knox, log4cxx2, MetaModel, MRQL, Olingo, Open Climate Workbench, Phoenix, Provisionr, Samza, Sentry, Sirona, Spark, Storm, Stratos, Tajo, Tez, Twill, Usergrid entered the Apache Incubator. Apache Provisionr retired from the Incubator. Milestone project releases include Cassandra 1.2 and 2.0, OpenOffice 4.0, and Subversion 1.8.0. Apache Struts 1 announces End-Of-Life, and recommends Struts 2 as successor. Apache C++ Standard Library (STDCXX), ESME, and XMLBeans moved to the Attic. The ASF issues a statement on Oracle's Technology Compatibility Kit License. Shane Curcuru, Doug Cutting, Bertrand Delacretaz, Roy Fielding, Jim Jagielski, Chris Mattmann, Brett Porter, Sam Ruby, and Greg Stein were elected to the ASF Board of Directors. The office of Vice President, Conference Planning, was dissolved; committee was renamed to Events Planning. 36 new ASF Members were elected, bringing the active membership to 468 individuals. ASF Sponsors are Citrix, Facebook, Google, Microsoft, and Yahoo! at the Platinum level; AMD, Hortonworks, HP, IBM, and Matt Mullenweg at the Gold level; Basis Technology, Cloudera, GoDaddy, Huawei, InMotion Hosting, PSW GROUP, SpringSource, and WANdisco at the Silver level; and BlueNog, Digital Primates, Intuit, Joost, Liip AG SA Ltd, Lucid Imagination, Talend, Twitter, and Two Sigma Investments at the Bronze level. Freie Universität Berlin (FUB) committed to become the provider of Apache server hosting and bandwidth in Europe. The ASF was accepted into the Google Summer of Code (GSoC) as a mentoring organization for the ninth consecutive year; hundreds of students have been mentored in "The Apache Way" under the guidance of the ASF Community Development Project, with many continuing to be long-term code committers on a variety of Apache projects, as well as some active program participants elected as ASF Members. ApacheCon North America took place in Portland, Oregon. The ASF exceeded 2 Million code commits: the two millionth revision was by ASF Member Daniel Kulp on behalf of the Apache CXF Project. The Apache HTTP Server remains the world's leading Web server: the Netcraft September Web Server Survey exceeded a billion Websites, stating "Apache truly dominates this market, with more than half of all active sites choosing to use Apache software". Interest in Apache's projects continued to boom, accelerating development and participation by 100% in four years: Apache Allura, Celix, Knox, Olingo, Open Climate Workbench, Phoenix, Spark, Storm, Stratos, Tajo, Tez, VXQuery became Top-level Projects. Argus, Brooklyn, Calcite, DataFu, Flink, HTrace, Ignite, Johnzon, Lens, Parquet, REEF, Slider, Tamaya, and Taverna entered the Apache Incubator. Milestone project releases included Cayenne 3.1, CloudStack 4.3, Log4j 2, SpamAssassin 3.4.0, and Spark 1.0. Apache Click was retired to the Attic. Apache OpenOffice reached a major adoption milestone with 100 million downloads. Apache TomEE won a Duke's Choice and Geek Choice Award; DeltaSpike, dubbed "the Swiss Army Knife of modern Java EE" won a Duke's Choice Award. The ASF Celebrated Document Freedom Day, with numerous Apache Projects supporting standards-based document accessibility and interoperability. Rich Bowen, Doug Cutting, Bertrand Delacretaz, Ross Gardler, Jim Jagielski, Chris Mattmann, Brett Porter, Sam Ruby, and Greg Stein were elected to the ASF Board of Directors. The ASF boasts 505 active Members and 4,081 Apache Committers. The ASF Infrastructure team continues to keep the ASF's multi-datacenter, multi-cloud deployment running 24x7x365 on multiple continents, distributing terabytes of artifacts per week and archiving more than 11 million Apache email messages. Apache's repositories changed greatly with the introduction of Git to the source code management system four years ago; since then the original Subversion repository had been decentralized and augmented with 268 Git repositories, and a robust GitHub presence with 564 different repositories. In addition, the Infrastructure team launched a new status service that provides extensive information about the health of the Apache infrastructure and activity within its projects, as well as a new code signing service for Java, Windows and Android applications for any Apache project to use to sign their releases. The ASF provided new "Powered by Apache" graphical assets for Apache projects, developers, and users to identify their affiliation with products and initiatives under the Apache umbrella. The ASF continues to flourish thanks to support from Platinum Sponsors Citrix, Facebook, Google, Matt Mullenweg, Microsoft, and Yahoo! ; Gold Sponsors Cloudera, Comcast, HP, Hortonworks, and IBM; Silver Sponsors Budget Direct, Cerner, Huawei, InMotion Hosting, Pivotal, Produban, and WANdisco; and Bronze Sponsors Accor, Basis Technology, Bluehost, Cloudsoft Corporation, Samsung, Talend, and Twitter. The ASF decided to accept donations using Bitcoin, and received more than 90 transactions within 48 hours of opening its Bitcoin wallet. ApacheCon North America took place in Denver, Colorado, and ApacheCon Europe was held in Budapest, Hungary. Powers smart search and indexing solutions for AOL, Apple, Comcast, Disney, IBM, LinkedIn, Twitter, Wikipedia, and more. Forest Hill, MD – 27 September 2011 – The Apache Software Foundation (ASF), the all-volunteer developers, stewards, and incubators of nearly 150 Open Source projects and initiatives, today announced the 10th anniversary of Apache Lucene. The Lucene information retrieval software was first developed in 1997, entered the ASF as a sub-project of the Apache Jakarta project in 2001, and became a standalone, Top-Level Project (TLP) in 2005. Apache Top-Level Projects and their communities demonstrate that they are well-governed under the Foundation’s meritocratic, consensus-driven process and principles. "Ten years ago, Apache provided Lucene a home where it could build a solid community. Today we can see the fruit of that community, both through the wide breadth of Lucene-based applications deployed, and through the depth of improvements to Lucene made in the past decade," said Doug Cutting, ASF Chairman and original Lucene creator. Apache Lucene powers smart search and indexing for eCommerce, financial services, business intelligence, travel, social networking, libraries, publishing, government, and defense solutions. Highly performant, Apache Lucene is in use across an array of applications, from mobile to Internet scale, and powers enterprise-grade search solutions for AOL, Apple, IBM (including its artificial intelligence-driven supercomputer Watson), LinkedIn, Netflix, Wikipedia, Zappos, and many other global organizations. "When it arrived to ASF, Lucene immediately made a huge impact --Lucene was one of those technologies that made a whole generation of businesses possible-- it was fast, easy to use, free, and had a growing community of users and developers. Apache Lucene can be found in an amazing number of products and services we all know and use, as well as in products and services we have never heard of,” said ASF Member and Apache Lucene Committer Otis Gospodnetic. "While it's been six years since I joined the Lucene community, the last two were certainly the most exciting,” said Simon Willnauer, Vice President of Apache Lucene. Current Apache Lucene sub-projects are PyLucene and Open Relevance; other sub-projects, including Droids, Lucene.Net, and Lucy, have spun out of the project and are undergoing further development in the Apache Incubator with the intention of becoming standalone TLPs. Solr, the high-speed Open Source enterprise search platform, has merged into the Lucene project itself, whilst former Lucene sub-projects Hadoop, Mahout, Nutch, and Tika have all successfully graduated as autonomous Apache Hadoop, Apache Mahout, Apache Nutch, and Apache Tika TLPs. Originally written in Java, Apache Lucene is available in many programming languages such as Perl, C#, C++, PHP, Python, and Ruby. “Now, 10 years later, Apache Lucene is backed by a large community of users, contributors and developers with incredible energy poured into Lucene every hour of every day of the year," said Gospodnetic, who is also co-author of Lucene in Action, and founder of Sematext International. “Even after 10 years, it seems this blazing community and codebase hasn't reached its potential yet,” added Willnauer. “I'm proud to be part of this community and look forward to another decade of Open Source Search." Hatcher, who is also co-author of Lucene in Action and co-founder of Lucid Imagination, added, “if you need search (and you do! ), Lucene is the best core technology choice." Apache Lucene software is released under the Apache License v2.0, and is overseen by a self-selected team of active contributors to the project. A Project Management Committee (PMC) guides the Project’s day-to-day operations, including community development and product releases. Apache Lucene source code, documentation, mailing lists, and related resources are available at http://lucene.apache.org/. "Apache" and “Apache Lucene” are trademarks of The Apache Software Foundation. All other brands and trademarks are the property of their respective owners. FOREST HILL, MD, 23 February, 2010 -- The Apache Software Foundation (ASF) -- developers, stewards, and incubators of 138 Open Source projects -- today announced the 15th anniversary of the Apache HTTP Web Server. The ASF's first project became the world's most popular Web server software within the first six months of its inception. The Apache HTTP Server today powers nearly 112 million Websites world-wide. A triumph for the all-volunteer Foundation, the Apache HTTP Server reliably delivers petabytes of data across the world’s most demanding uses, including real-time news sources, Fortune 100 enterprise portals, cloud computing clusters, financial services platforms, mission-critical military intelligence applications, aerospace communications networks, and more. The server software can be downloaded, modified and installed by anyone free of charge. of the NCSA httpd, a Web server created by Rob McCool at the National Center for Supercomputing Applications. Further development to the server ceased after McCool's departure from NCSA in 1994, so an online community of individuals was formed to support and enhance its software via email collaboration. The founding members of that community (the Apache Group) included Brian Behlendorf, Roy Fielding, Rob Hartill, David Robinson, Cliff Skolnick, Randy Terbush, Robert Thau, and Andrew Wilson. Within less than a year of the Apache Group's formation, the Apache server surpassed NCSA httpd as the #1 server on the Internet. In March 1999, members of the Apache Group formed The Apache Software Foundation to provide organizational, legal, and financial support for the Apache HTTP Server. An additional goal for the Foundation was to serve as a neutral, trusted platform for the development of community-driven software. Beyond the Apache HTTP Server, dozens of ASF projects – from build tools to Web services to cloud computing and more – lead the way in Open Source technology. At the ASF, community plays a vital role in the collaborative development of consensus-driven, enterprise-grade solutions. The number of projects led by the Apache community has grown from the singular Apache HTTP Server at the ASF's inception in 1999 to nearly 140 projects today. The ASF's commitment to fostering a collaborative approach to development has long served as a model for producing consistently high quality software and helping advance the future of open development. Through its leadership, robust community, and meritocratic process known as the "Apache Way", the ASF continues to gain recognition as one of the most successful influencers in Open Source. Through the Apache Way, the ASF is able to spearhead new projects that meet the demands of the marketplace and help users achieve their business goals. With the Apache Incubator mentoring more projects than ever before, the ASF continues to meet the growing demand for quality Open Source products. "Community Over Code": among the Foundation's core tenets is open collaboration through respectful, honest, technically-focused interaction. The ASF's success is testament to its outstanding community efforts that serve as best practices widely embraced by organizations and individuals alike. "If it didn't happen on-list, it didn't happen": building upon the transparency-oriented culture of the Apache Group, whose collaboration took place on email lists, millions of messages are archived on Apache publicly-accessible mailing lists, documenting the ASF's achievements over the past decade. "Meritocracy in Action": the ASF's tagline reflects an average of 10,000 code contributions (commits) made each month. The ASF is responsible for millions of lines of code by more than 2,000 ASF Committers and countless contributors across the Open Source landscape. Nearly 500 community-driven modules have been developed to extend functionality of the Apache HTTP Server alone. February 23, 1994: Individual patch authors around the world are invited to join the "new-httpd" mailing list to discuss enhancements and future releases of NCSA httpd. The Apache name was chosen for this new effort within the first few days of discussion, along with basic rules for email-based collaboration and a mission to replace the existing server with a standards-based, open source, and extensible software system. Apache server v.1.0 was released in December 1995. Four years later, Apache HTTP Server v.1.3.0 was released, and rapidly becoming the most popular Web server on the planet. Apache HTTP Server v.2.0 alpha was released in March 2000, with the first general availability release two years later. V.2.0 remained best-of-breed sever until the release of v.2.2.0 in December 2005, and is widely deployed across the Internet. In February 2009, the Apache HTTP Server became the first Web server software in history to surpass the 100 million Website milestone. The most current, best-of-breed, stable version of the Apache HTTP Server is v.2.2.14, released September 2009. Developers seeking to test new features and preview what will become stable Version 2.4 are able to do so today with the development of v.2.3.5. Earlier this month, after ten years and more than forty revisions, the Apache HTTP Server v.1.3.x officially reached end of life status with the release of v.1.3.42. Future patches to v.1.3.x will be for critical security updates only. The Apache HTTP Server remains the world's most beloved Web server, forming the backbone of nearly 70% of all sites on the Internet. The Apache HTTP Server is available for a variety of operating systems, including Unix, Linux, GNU, FreeBSD, Netware, Solaris, Windows, Mac OS X, OS/2, TPF, and eCS. In addition, the Apache HTTP Server is redistributed through many proprietary software packages such as WebSphere, Oracle RDBMS, Kylix, NetWare, and Delphi, as well as numerous Linux distributions. Established in 1999, the all-volunteer Foundation oversees more than seventy leading Open Source projects, including Apache HTTP Server — the world's most popular Web server software. Through The ASF's meritocratic process known as "The Apache Way," more than 300 individual Members and 2,000 Committers successfully collaborate to develop freely available enterprise-grade software, benefiting millions of users worldwide: thousands of software solutions are distributed under the Apache License; and the community actively participates in ASF mailing lists, mentoring initiatives, and ApacheCon, the Foundation's official user conference, trainings, and expo. The ASF is funded by individual donations and corporate sponsors including Facebook, Google, HP, Microsoft, Progress Software, SpringSource, and Yahoo! For more information, visit http://www.apache.org/. As mentioned in a previous post, California Governor Arnold Schwarzenegger and Oakland Mayor Ron Dellums have recently recognized The Apache Software Foundation for a decade of open source leadership and technology innovation. 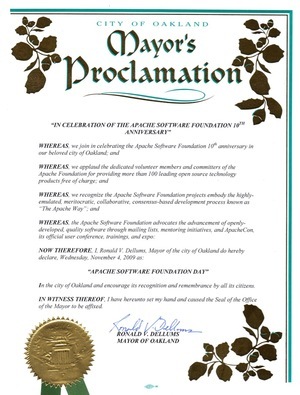 Mayor Dellums proclaimed November 4th, 2009 as the Apache Software Foundation Day! Here are their letters, as presented last week at ApacheCon US 2009 in Oakland, CA. Click on the thumbnails for larger images. Not only does the Apache HTTP Server power more than 106 million Websites worldwide, an astounding 89% of Linux Journal readers have chosen the “competitor-less” Apache HTTP Server as their favorite Web server, according to the 2009 Reader’s Choice Awards. Congratulations to the Apache HTTP Server Project for more than 16 years of technical excllence! The ASF is ten years old today! Exactly ten years ago, Roy Fielding signed the Certificate of Incorporation of The Apache Software Foundation. As I'm writing this post, our chairman Jim Jagielski is giving the traditional "State of the Feather" talk at ApacheCon Europe 2009. Today, the ASF comprises nearly 300 individual Members and over 2,000 Committers collaborating across six continents - that makes our founders proud! Our press team has collected some highlights of the last ten years, and they are impressive. As part of its 10th Anniversary, the ASF will be highlighting various projects, initiatives, individuals, and organizations from the Apache community throughout the year. 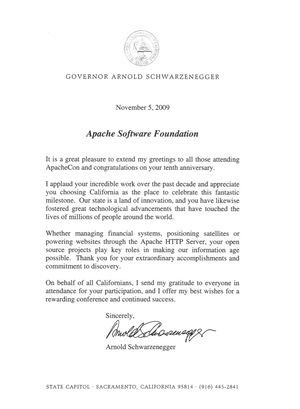 The Foundation's ongoing celebrations will culminate at ApacheCon US 2009, taking place 2-6 November 2009 in Oakland, California. Please join us in congratulating all the people who make the ASF possible, and who played a role in getting it to where it is today. The ASF would go nowhere without the countless volunteers who are the backbone of the Foundation! If you're at ApacheCon, join us for the anniversary cake tonight, during the welcome reception at 6:30PM. And even if you're not, help us spread the word! And let's get the comments counter up on this blog post! Update 1: The cake has been served. Update 2: Read the letter by Jim Jagielski, the ASF's current chairman, about the ASF's 10 year anniversary. Update 3: Tune in Friday to watch the keynote panel by ASF founders this Friday, steamed live from ApacheCon Europe!